Hybrid Turkeys offers unique products to meet the needs of turkey growers, processors and integrators. Each product is designed to maximize economic return at different market weights. A well-balanced nutritious diet is essential for bird performance. In general the Hubbard broiler range of the JV, Classic, F15, Flex, H1 and H1 FF are well recognized for its growth, excellent FRC and good animal welfare traits (such as very low levels of hock burn and footpad lesions) in combination with good yields in the processing plant and flexibility to be used for a wide range of bodyweights and final products. Ross is the world’s number one broiler breeder brand. With a product range that offers customers the solution for all requirements, first-class genetics and product performance and a comprehensive global distributor network, it’s no wonder Ross is the breed of choice for the global poultry industry. The Ross 308 is the world’s most popular broiler, providing integrated operations with the perfect balance of breeder, broiler and processing performance. The world’s most efficient broiler has the lowest feed conversion, best growth rate and an ability to thrive on low density, less costly nutrition. 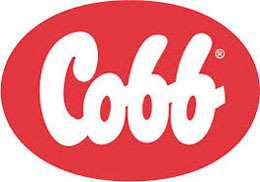 These attributes combine to give the Cobb500 the competitive advantage of the lowest cost per kilogram or pound of live-weight produced for the growing customer base worldwide.